India is a land of many religions and Jain Dharma is one of them belonging to the śramaṇa tradition. The three main principles of Jainism are Ahimsa (non-violence), Anekantavada (non-absolutism), and Aparigraha (non-possessiveness). 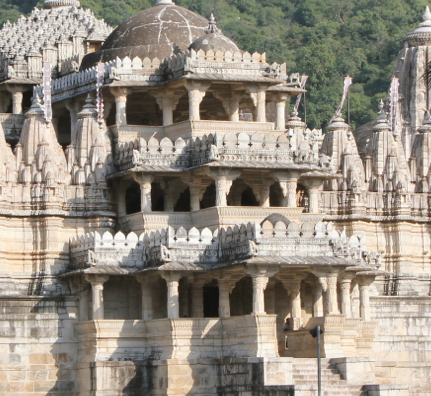 There are many famous Jain temples in India known for their marvellous architecture and stone carvings. Read on to know about most visited,beautiful and famous Jain Temples in India. Though there are lots more Jain temples and pilgrimage all over the India but I visit theses eight Jain temples which inspire me a lot and really give me an inner peace so here I am with 8 famous Jain Temples and Pilgrimage in India. 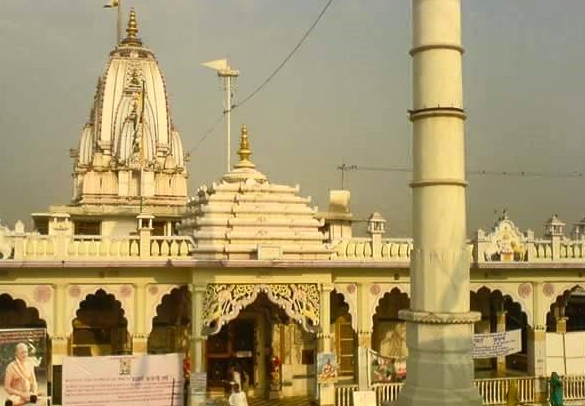 Shri Digambar Jain Lal Mandir is a beautiful and one of the oldest and famous Jain temples in india which is located opposite to Red Fort in Old Delhi. It is dedicated to 23rd Tirthankara, Parashvanath and houses the Birds Charity Hospital to give free treatment to the injured birds. 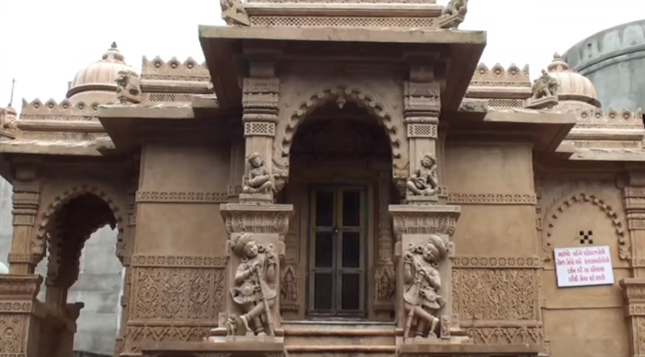 The Digambar Jain Temple was built in 1656 by red sandstone that's why called Lal Mandir. The main prayer area of the temple is on the first floor. There are a number of shrines inside the temple but the main shrine is of Lord Mahavira the 24th and the last Tirthankara of the present era. One can also buy lots of books on Jainism from the bookstore in the complex. Visitors should take off their shoes and all other leather goods before entering the temple complex. Beautiful Dilwara temples are one among the famous jain temples of india which is famous for its extraordinary architecture and marvellous white marble stone carvings. These temples were built between 11th to 13th centuries AD by Vastupal-Tejpal, a Jain layman. 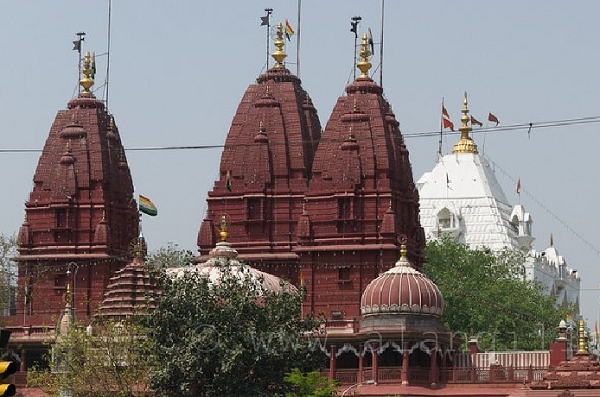 Dilwara Temple complex consist of five major temples devoted to Five Jain saints namely- Shri Mahaveer Swami Temple, Shri AdiNath Temple or Vimal Vasahi Temple, Shri Nemi NathJi Temple or Luna Vasahi Temple, Shri ParshavNath Temple or Khartar Vasahi Temple and Shri Rishabh Deoji Temple or Peethala Temple. Temples remain open from 12 P.M. to 5 P.M. for tourists and photography is strictly prohibited inside the temple complex. One can see the marvellous minute carving detail spreading over ceilings, doorways, pillars and panels of the temple complex. 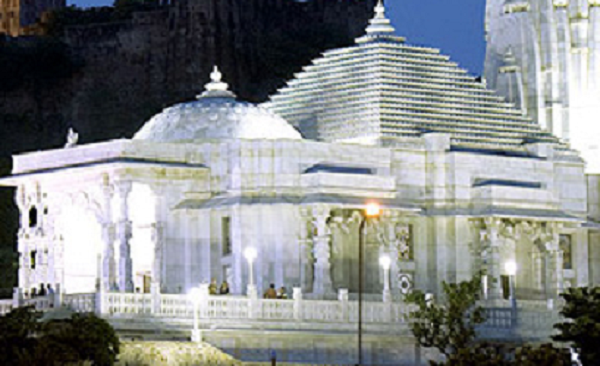 This is a famous jain temples in India and also from one of the five major pilgrimages (temples) of the Jains. This temple is famous for its detailed and superb architectural style. The temple is built by Seth Dharna Sah, a Jain businessman with the help of Rana Kumbha, ruler of Mewar in the 15th century. Ranakpur Temple is constructed in light coloured marble and more than 1400 beautifully carved pillars support it that change their colour from golden to pale blue after every hour during the day. Several other temples like Chaumukha temple (four faced temple), Parashvanath temple, Amba Mata Temple and Surya Temple are also located inside the temple complex. 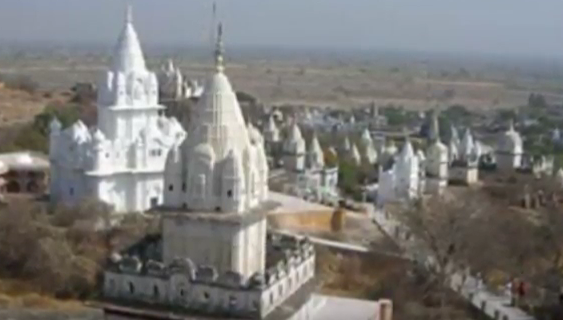 Bawangaja is a famous Jain temple in the Barwani district of Madhya Pradesh in India. It is famous for its world's tallest statue of the first Jain Tirthankara Adinatha standing in the posture of meditation. The height of the statue is 84 feet (26 m) and was created early in the 12th century. This beautiful statue is made by cutting rock of one single mountain only which makes it more unique and famous. On the left side of the Bhagwan Adinath statue, the four armed 'Gomukh Yaksha' & on the right side sixteen armed 'Yakshi Chakreshvary' idols are established. It is one of the holiest pilgrimage and temples for Jains. Shikhar Ji Temple is located on Parasnath Hills in Giridih district of Jharkhand at the height of 4429 feet in the middle of barren and agricultural plains of Chikri in Jharkhand. It is the salvation place of 20 Tirthankaras and a large number of saints so also called as Teerthraj. Teerthraj Shikharji has 30 Tonks (marble structure), in addition to the Jal Mandir. It is believed that Parasnath, twenty-third Tirthankara have attained Moksha at the site. One can also go for parikrama of 54 km of the entire Parasnath Hill through the forest by walking only. On the walls of the Jain temple at the village of Madhuban a mural painting depicting all the temples on Parasnath Hill displayed. 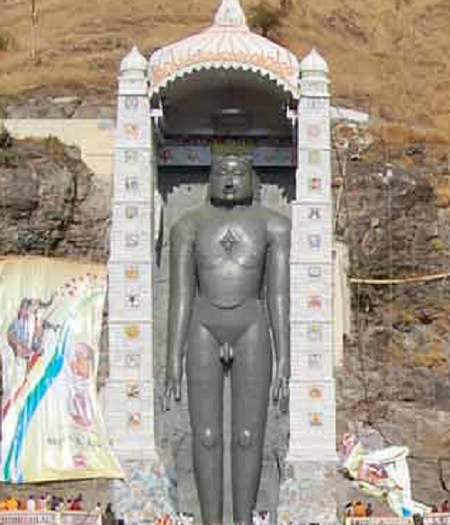 It is the most visited Jain pilgrimage in India dedicated to the 8th Teerthankar Shri Chandra Prabhu. This is one of the most famous jain temples in india which is located in Tijara, District Alwar (Rajasthan) is an Atishaya Kshetra or a Place of Salvation. The idol of Bhagwan Chandra Prabhu is 15 inch high made up of white stone. The statue was discovered on August 16, 1956, after digging. On March 29, 1972, another idol of Bhagwan Chandra Prabhu was digging under the gate of a room situated in the south of the temple premises. The second idol of Bhagwan Chandra Prabhu is 8 inch in height and black in colour. Both the idols are established in the very beautifully constructed rectangular temple. Hall of this temple has the capacity to hold 2000 worshippers at a time. Walls of the temple are decorated with glass work and colourful paintings based on mythological stories. The temple is located on Shatrunjaya hill by the city of Palitana in Bhavnagar district, Gujarat, India. It is considered as one of the holiest of all pilgrimage places by the Jain community. To reach the temple one has to climb through 3950 steps (3.5 km). Palitana Temples are constructed in two phases first from 11th to 12th centuries AD later from the 16th century AD onwards. There are 1000 of Jain temples scattered on the Shatrunjaya hills along with the main temple at the top of the hill. Jain community believes that every person has to visit Palitana once in a lifetime chance to achieve nirvana or salvation. It is a sacred place for Digambar Jains as Chandra Prabhu the 8th Tirthankara and many ascetic saints achieved Moksha from this site. 77 beautiful and famous Jain temples of India in the 9th & 10th century are located on Sonagiri Hills and twenty-six temples in the village about 60 km from Gwalior. The temple number fifty-seven is the main temple dedicated to Lord Chandraprabhu. The statue of Chandraprabhu of eleven feet height is constructed inside the temple. Two other beautiful idols of Lord Sheetalnath & Parsvnath are also installed in this temple. The Samavsharan of Bhagwan Chandraprabhu came here for 17 times.